WMS integrates the Receiving, Picking and Ship Order modules, which are also available separately. Warehouses and Stock Rooms associated with Manufacturing plants. Industrial Distributions Centers with secondary operations such as repack, relabeling, kitting, and assembly where the products are shipped to Distribution Centers or direct to manufacturing plants, engineering, or construction sites..
Project-focused Make-to-Order, Engineer-to-Order, Repair, Refurbishment, Contracting and Construction organizations. Food, Pharmaceutical, and Medical processing and distribution, where materials traceability is required. Website plus SQL Server database that runs on a Windows Server computer. Web-browser interface can be used on a wide variety of barcode data collection devices including wireless mobile computers, tablets and PCs equipped with barcode scanners. Inventory status can be viewed in real-time over Internet using mobile phones. 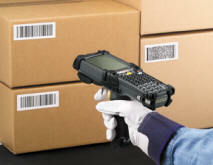 Prints barcode labels on demand in customer specified formats. Tracks operations at multiple geographically distributed warehouses and stock rooms. Interfaces available for automated data exchange with ERP, accounting, and E-Commerce systems. Interfaces available for supply chain integration, including preparing Advanced Shipment Notice data by for transmission by EDI. Interfaces available for weighing scales, RFID portals, and other Internet-of-Things devices. Receiving and put-away of materials. Weighing and labeling of materials. Fetching materials to production operation, including kit picking. Returning of materials to stock. Picking and packing of customer orders. Staging of materials for loading. Loading of trucks and trailers. Return of materials from customers. Nested container, location, facility, yard, customer site, in-transit, and in service trucks. Supplier, Make, Model, Physical Origin, and Lot number as well as serial numbers on equipment. Who owns the Inventory: Customers, Vendors, US Government, or organization running the Warehouse. Project that this inventory was purchased for to avoid mixing and misuse of project materials. Age and Expiration date plus quality control status: waiting, passed, failed inspection, needs material review. User defined attributes such as width, length, color, hardness, and heat number. Hazardous materials category as well as special storage requirements: freezer, refrigerator, secure locations. Tracking by length, width, size, color, weight and multiple user-defined units of measure. FDA, USDA, HACCP, HIPPA, and CFR 21 Part 11 compliant. Easy to use for material handlers who are not computer literate and use English as a second language. BellHawk tracks the packing of parcels and their hand-over to FedEx and UPS for shipment. With the shipping dock option, BellHawk WMS tracks the loading of trucks/trailers. But BellHawk does not, as standard, support interfaces to UPS, FedEx or other shipping systems. This integration needs to be done by clients or their systems integrators using one of the interfaces that BellHawk provides for this purpose..
BellHawk uses license-plate tracking methods, including tracking and generating labels for materials in nested containers, such as cartons on pallets but it is not a shipping system. Standard WMS and ERP systems track inventory by location and typically have extensive integration with supply chain systems such as those from UPS and FedEx as well as with EDI. Has a variety of interfaces through which clients can implement automated data exchange with BellHawk.